Purpose: To study the clinical and histopathological characteristics of uveal melanomas in Asian Indians and compare them with other ethnic groups. Materials and Methods: One hundred and three enucleated eyes with clinical diagnosis of uveal melanoma were retrospectively studied (1987-2001) and the clinical and pathological features analysed. Results: Uveal melanomas constituted 0.02% of outpatients in a referral eye hospital in India over a 12-year period. The patients were predominantly males. Uveal melanomas tended to occur in the younger age. The mean age was 45.7±14.2 years. Melanoma involved the choroid in 90 (87.37%) patients, and both choroid and ciliary body in 13 (12.62%) patients. Mean basal diameter of the tumour was 13.43±5.32 mm. Mixed cell type was more common. Conclusion: Uveal melanomas are rare in the Asian Indians compared to those in the West. They occur in younger persons, have a greater mean basal diameter than that of Caucasians and are predominantly of the mixed cell type. Malignant melanoma of the choroid is rare in Asians and other dark pigmented races. ,,Whites have a three- fold greater risk of developing uveal melanoma compared to Asian Indian populations. Significant differences in the clinical and pathological presentation of uveal melanomas in certain pigmented races, compared to the Caucasian, Japanese, and Chinese populations are reported in earlier studies., , However, there are no large studies on the clinical and the histopathological features of uveal melanomas in the Asian Indian population. We retrospectively analysed the clinical and histopathological characteristics of uveal melanomas over a 14-year period and compared these findings to those of Caucasian, Japanese, Chinese, Black and Hispanic populations reported in the literature. Between 1987 and 2001, 103 patients underwent enucleation with a clinical diagnosis of uveal melanoma in our institute. The clinical details including patient age, gender, laterality and time elapsed since diagnosis were studied. The enucleated eyes were fixed in 10% neutral buffered formalin and subjected to histopathological study. Vortex veins were identified and sectioned separately to identify the presence of melanoma cells. Gross examination was done under a dissecting microscope (Leica WILD M 3C). Largest basal diameter of the tumour and the location of the tumour (choroid alone, ciliary body alone or both) were recorded. Histopathological features noted included cell type of the tumour, necrotic changes, intrascleral extension, vortex vein invasion and optic nerve invasion. Baseline systemic evaluation was done in all patients at the time of diagnosis. It included X-ray chest, ultrasound abdomen and liver function test. Patients were advised to come for periodic follow-up once in six months. Those who missed follow-up were contacted by post. The report of the referral ophthalmologist regarding the survival was included. Uveal melanomas constituted 0.02% of the total new outpatients in a referral eye hospital over a period of 14 years. In this study group, 63 were males (61.16%), the right and left eye were nearly equally involved (51.5% and 48.5% respectively), the mean age was 45.7±14.2 years, and 50.46% of patients were less than 45 years of age at presentation. Four patients with malignant uveal melanoma had an unusual presentation. Two (1.94%) presented with orbital cellulitis. Two (1.94%) patients had oculodermal melanocytosis and one of them presented with anterior uveitis and secondary cataract due to malignant melanoma of the choroid. One patient had a diffuse choroidal melanoma, which mimicked choroidal metastasis. Anterior segment involvement was seen in 32 (31.06%) cases, which included rubeosis iris in 11 (10.06%), neovascular glaucoma in 13 (12.62%), anterior uveitis in 7 (6.79%) and secondary glaucoma in 2 (1.94 %) patients. Mean basal diameter of the tumour was 13.43 ± 5.32 mm and the mean height of the tumour was 9.63 ± 4.25 mm on gross examination [Table - 1]. Melanoma involved the choroid in 90 (87.37%) cases, and both choroid and ciliary body in 13 (12.62%) cases. Mixed cell type was seen in 56 tumours (54.36 %); spindle B cell was seen in 36 tumours (34.95%), and epithelioid cells in only 11 tumours (10.67%) [Table - 2]. Necrosis was seen in 18 tumours (17.47%). Intrascleral invasion was seen in 7 eyes (6.79%) and extrascleral invasion was seen in 8 eyes (7.76%). Optic nerve invasion was seen in 8 eyes (7.76%); and 4 eyes (3.89 %) had vortex vein invasion. Fifteen patients (14.56%) had follow-up for more than 3 years, 25 patients (24.27%) for more than 2 years, 30 patients (29.12%) for more than a year and 32 (31.06%) patients for less than a year. One (0.96%) patient died due to liver metastasis. Malignant melanoma of the uveal tract is rare in India and among Asian Indians. Because of the relative rarity of the condition it is not often suspected till the tumour is large enough to cause a secondary retinal detachment. It is likely to be wrongly diagnosed as primary retinal detachment. There is only one series of 5 cases of malignant melanoma of the choroid and three isolated cases reported in the Indian literature., ,,There are no large series on the uveal melanomas in the Asian Indian population. Malignant melanoma of the choroid is rare in dark pigmented races and has been reported infrequently in the Asian Indian population. The reasons for the differences are yet unclear. Ultraviolet (UV) radiation has been suggested as a major cause of malignant melanoma of the skin and uvea because of the increased incidence and mortality among Caucasians living in tropical regions, where solar radiation is more intense. Most choroidal melanomas have been diagnosed in white patients over 50 years of age.,  In the Collaborative Ocular Melanoma Study, 1302 patients eligible for the study had a mean age of 60.2 years. Only 14% of patients were below 50 years of age. 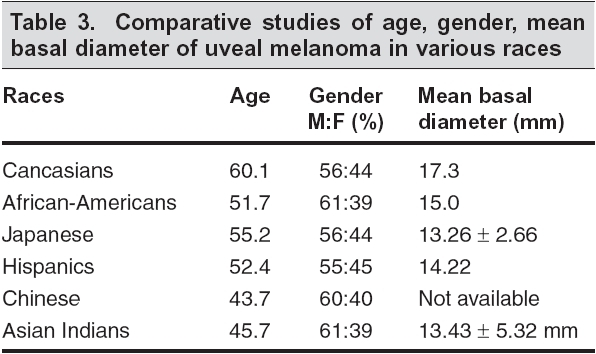 Hispanic, Blacks, Japanese, and Chinese patients have been noted to be younger at the time of diagnosis.,,, This mean reported age of diagnosed uveal melanoma is 43.7 years in Chinese, 51.6 years in American blacks, 55.2 years in Japanese, and 52.4 years in the Hispanic population [Table - 3]. In our study the age range was between 14 and 82. The mean age range was 45.7±14.2 years. Fifty one (50%) patients were younger than 45 of age. The reasons for younger age of incidence in our patients are not known. Because of the rarity of the uveal melanomas in Asian Indians the possibility of misdiagnosis is also quite high. We had 4 unusual presentations of uveal melanoma, which caused diagnostic challenge. There were 2 cases of uveal melanoma presenting as orbital cellulitis. Orbital cellulitis could be the initial presentation of the malignant melanoma of the choroid when such tumours undergo necrosis or extrascleral extension. Orbital cellulitis had been reported in uveal melanoma and retinoblastoma. One of the two cases had invasion of the optic nerve head beyond the lamina cribrosa. Unlike in retinoblastoma, malignant melanoma of the choroid rarely extends to the optic nerve except in peripapillary location. This melanoma was also unusual for the clear cell differentiation. Such clear cell variants of malignant melanoma are known to mimic metastatic clear cell carcinoma of the choroid. Melanoma of the choroid usually presents as a dome shaped or mushroom shaped pigmented mass with secondary retinal detachment. Such lesions can be diagnosed by indirect ophthalmoscopy and ultrasonography. Diffuse malignant melanoma is a rare variant with a flat growth pattern with thickness of 20% or less than the greatest basal dimension. 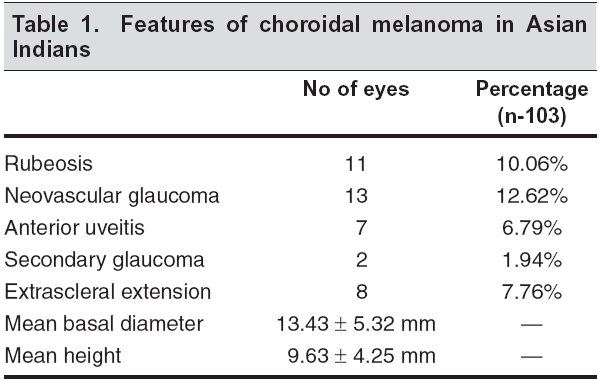 The incidence of diffuse choroidal melanoma is around 4-5% of all posterior uveal melanomas. ,,,,,,,,,,,,The risk of metastasis in these patients is relatively higher. ,Among all uveal melanomas, diffuse melanomas have a poor prognosis., In this series, we had one case of diffuse choroidal melanoma in a 44-year-old patient presenting as a yellow subretinal mass with secondary retinal detachment. The initial clinical diagnosis in this case was metastatic carcinoma of the choroid. Ultrasonography and magnetic resonance imaging supported the clinical diagnosis. A fine needle aspiration biopsy (FNAB) did not provide a definitive diagnosis. Subsequently there was an increase in the size of the mass on ultrasound. Enucleation was done with the suspicion of malignant melanoma of the choroid. Histopathology of the enucleated globe showed a diffuse malignant melanoma of the choroid involving 40% of the circumference of the globe. This case highlights the diagnostic difficulty in a case of diffuse malignant melanoma of the choroid. Delay in diagnosis is quite common in this variant of malignant melanoma of the choroid. These tumours also have an increased rate of extrascleral extension. Increase in tumour base and poorly defined margins correlate with poor prognosis. Uveal melanoma is rare in children and teenagers. The relative frequency of uveal melanoma in young patients (20 years of age or younger) compared with all patients with uveal melanoma was found to be 1.1% in Shields' study. In our series only one patient was less than 20 years old. Kuo PK, Puliafito CA, Wang KM, Liu HS, Wu BF. Uveal melanoma in China. Int Ophthalmol Clin 1982;22:57-71. Margo CE, McLean IW. Malignant melanoma of the choroid and ciliary body in black patients. Arch Ophthalmol 1984;102:77-79. Manohar S, Ramachandran R, Das T, Namperumalsamy P. Malignant melanoma of choroid. Indian J Ophthalmol 1991;39:70-73. The collaborative ocular melanoma study (COMS) randomised trial of pre-enucleation radiation of large choroidal melanoma. I: Characteristics of patients enrolled and not enrolled. COMS report No.9. Am J Opthalmol 1998;125:767-78. Sakamoto T, Sakamoto M, Yoshikawa H, Hata Y, Ishibashi T, Ohnishi T et al. Histological findings and prognosis of uveal malignant melanoma in Japanese patients. Am J Opthalmol 1996;121:276-83. Hudson LH, Valluri S, Rao NA. Choroidal melanomas in Hispanic patients. Am J Ophthalmol 1994;118:57-62. Biswas J, Ahuja VK, Shanmugam MP, Kurian R, Fernandez T. Malignant melanoma of the choroid presented as orbital cellulitis - Report of two cases with review of literature. Orbit 1999;18:123-30. Biswas J, Shanmugam MP, Gopal L. Malignant melanoma of the choroid in association with oculodermal melanocytosis: A case report. Indian J Ophthalmol 1995;43:140-41. Biswas J, Raghavendran R, Ratra V, Krishnakumar S, Gopal L, Shanmugam MP. Diffuse malignant melanoma of the choroid simulating metastatic tumour in the choroid. Indian J Ophthalmol 2000;48:137-40. Seddon JM, Evangelos S, Gragoudas, Host factors, UV radiations and Risk of uveal melanoma. A case-control study. Arch Ophthalmol 1990;108:1274-80. Shields JA, Shields CL. Intraocular tumours . A Text and Atlas . Philadelphia; W.B. Saunders, 1992. 1st ed, pp 45-59. Zimmerman LE. Malignant melanoma of the uveal tract. In: Spencer W.H., editor. Ophthalmic Pathology . 4th edi Philadelphia, W.B. Saunders, 1996. Vol.3, pp 2072-139. McLean IW, Foster WD, Zimmerman LE. Uveal melanoma location, size, cell type and enucleation as risk factors in metastasis. Hum Pathol 1982;13:123. Sedden JM, Albert DM, Lavin PT, Robinson N. A prognostic factor study of disease-free interval and survival following enucleation for uveal melanoma. Arch Ophthalmol 1983;101:1894. Fraser DJ, Font RL, Ocular inflammation and hemorrhage as the initial manifestation of uveal malignant melanoma-incidence and prognosis. Arch Ophthalmol 1979;97:1311-14. Grossniklaus HE, Albert DM, Green WR, Conwas BP, Hovland KR. Collaborative ocular melanoma study group. Clear cell differentiation in choroidal melanoma. COMS report. No 8. Arch Ophthalmol 1997;115;894-98. Reese AB, Howard GM. Flat Uveal melanomas. Am J Ophthalmol 1967;64:1021-28. Font RL, Spaulding AG, Zimmerman LE. Diffuse malignant melanoma of the uveal tract. A clinicopathologic report of 54 cases. Trans Am Acad Ophthalmol Otolaryngol 1968;72;877-95. Shields CL, Shields JA, Deport P, Cater J, Tardio D, Barret J. Diffuse choroidal melanoma - Clinical features predictive of metastasis. Arch Ophthalmol 1996;114:956-63. Gonder JR, Shields JA, Albert DM, Augsburger JJ, Lavin PT. Uveal malignant melanoma associated with ocular and oculodermal melanocytosis. Ophthalmology 1982;89:953-60. Velazquez N, Jones IS. Ocular and oculodermal melanocytosis associated with uveal melanoma. Ophthalmology 1983;90:1472-76. Shields CL, Shields JA, Milite J, Potter PD, Sabbagh R, Menduke H. Uveal melanoma in teenagers and children - A report of 40 cases. Ophthalmology 1991;98:1662-66. Lee, C.S., Lee, J., Choi, J.J., Yang, W.I., Yoon, J.S., Lee, S.Y., Lee, S.C.
You, Q.S., Xu, L., Jonas, J.B., Wang, S., Yang, H.
Lakhtakia, R., Mehta, A., Nema, S.K. Majima, Y., Tamano, M., Sasai, T., Maeda, M., Yamagishi, H., Fujii, Y., Terauchi, M., (...), Hiraishi, H.
Graell, X., Caminal, J.M., Masuet, C., Arias, L., Rubio, M., Pujol, O., Roca, G., Arruga, J.